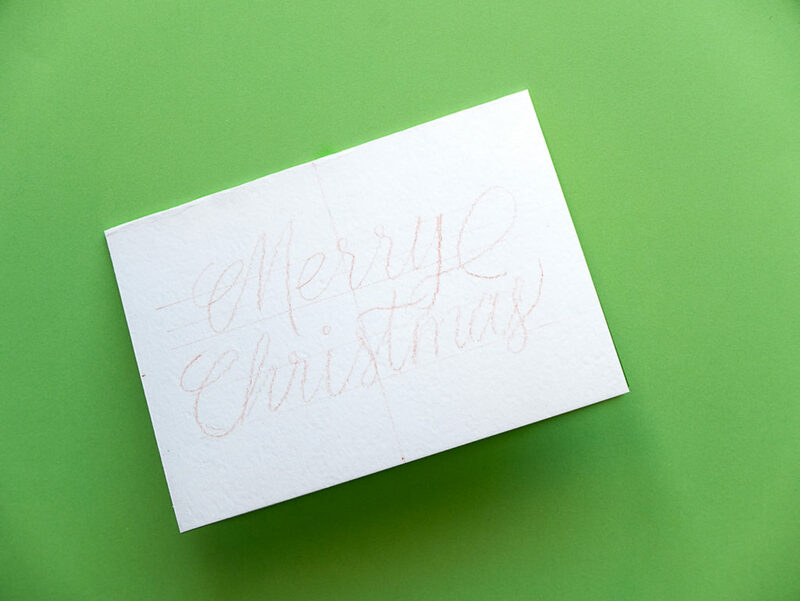 One of the best things about being a calligrapher is being able to DIY cards for Christmas, birthdays, weddings and any other event that pops up. 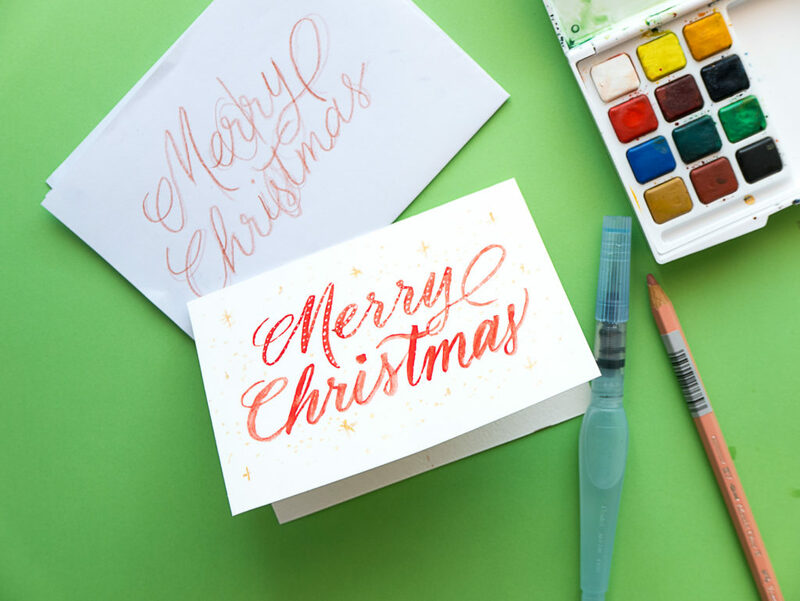 Even if you’ve only begun learning lettering and don’t yet feel confident with your skills, I’ve found that friends and family enjoy receiving something heartfelt and homemade. 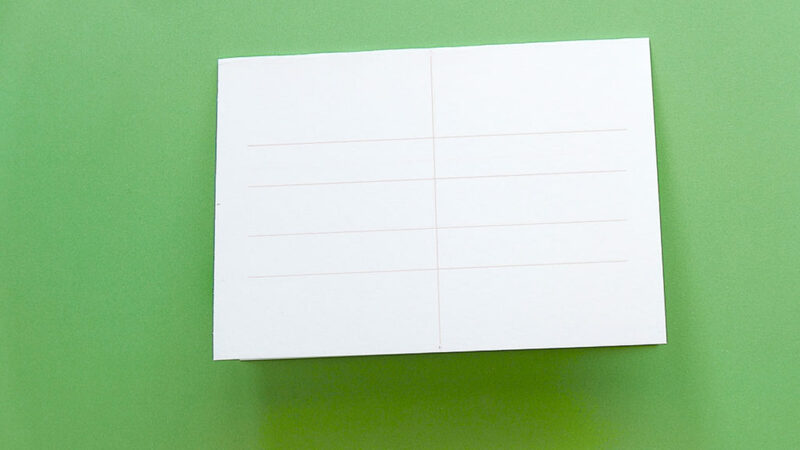 A sheet of card, folded in half – I like to use an A5 which then folds down into an A6 card, but it can be any size you like that will fit into your envelope. Depending on your writing tools, you may want to avoid shiny papers that cause ink to bead and not dry properly. Calligraphy tool of choice – I’ve used a brush and ink here, but a pointed dip pen or a marker can work too. 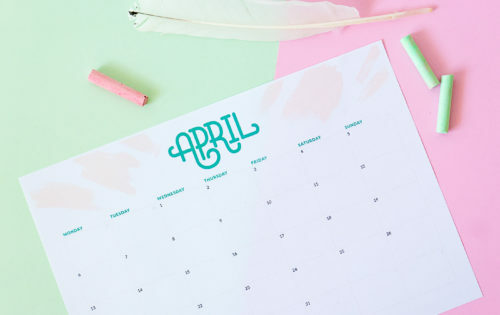 Unless you’re going with a very simple design or have a lot of practice, it helps to plan out what and how you will write. Sketch out an idea or two on some scrap paper, to get a feel for the composition and the width of the words. 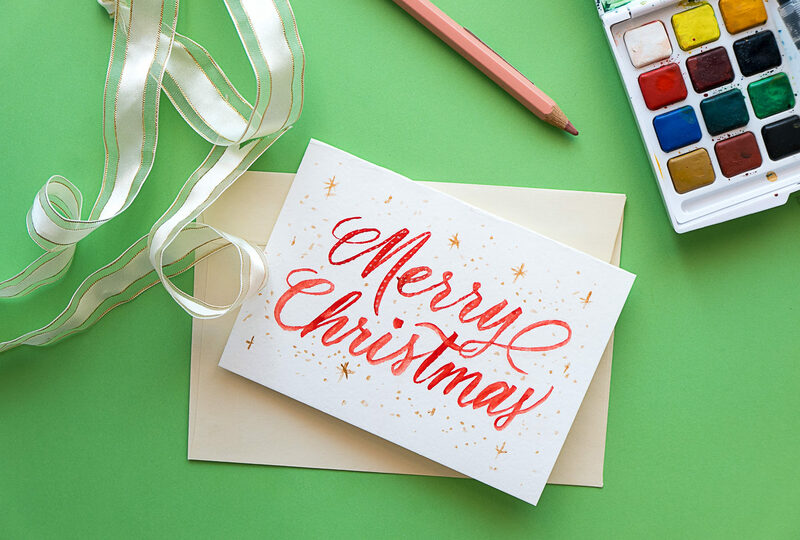 Using your pencil and ruler, mark out some guide lines for the baseline (the line the letters will sit on), x-height (the height of most lowercase letters), cap-height (height of capital letters) and the center of the card horizontally. For example, if I want to center the words ‘Merry Christmas’ on a single line, I’d count the characters (including the space) = 15 and find that the middle character is number 8 – ‘h’. 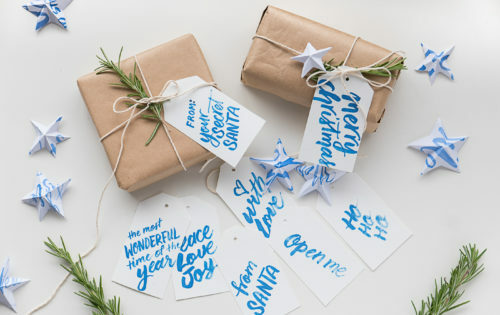 If I wanted to center each word separately, one over the other, the middle letters would be the first ‘r’ in ‘Merry’, and the ‘s’ in ‘Christmas’. Of course this is just a rough guide, as some letters will be wider than others, but it will help guide you in the next step. Keeping in mind that you want to land that middle letter roughly on the center line, lightly pencil in the skeleton of the letters. This could take a few tries to get right! Add in any flourishes or extra illustrations that you want to have sketched out as well. When you’re happy with the skeleton, go over the letters with your tool of choice. If you’re using a brush or a pointed pen (or are mimicking this effect with a marker), remember that in general down strokes will be heavy and up strokes will be light. Once the ink is dry, carefully erase the pencil marks and you’re done! Buy a pad of watercolour paper to keep on hand for emergency card making – it works beautifully with most tools and inks, comes in nice thick weights, and has a lovely texture. Experiment with different ink colours and combinations – I’m particularly loving metallic shades at the moment, particularly for embellishments. Try using diagonal or curved baselines for effect. If you mess up your centering, try adding some flourishes or illustration elements in the blank space to make it look intentional. I’ve recently started using a watercolour pencil in a pale shade rather than a lead pencil for sketching. 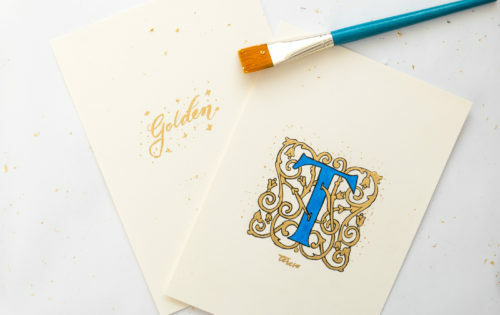 The marks will disappear as you write over them, and anything remaining can be carefully removed with a wet paintbrush. Good luck and happy lettering!